Every year the March for Choice has gotten bigger and bigger. This year will be no exception. Unfortunately this may mean some unwanted attention from the alt-right media or anti-choice counter-protesters. We’ve published this blog to share advice on dealing with these people, should they appear, and to share tips and information that will help you feel as safe as possible when Marching for Choice on 30th September. There was an alt-right media presence at Strike 4 Repeal earlier this year. They interviewed pro-choice people and heavily edited the video to mislead and to suit their agenda. We do not want to give people like this any oxygen or ammunition. There will be media present at the March, as it is one of the biggest events of the year, so you will see journalists with cameras and microphones. You can give interviews to media outlets if you wish, but you are absolutely not obliged to just because they ask. If anyone from the media approaches you, feel free to ask for their credentials. If you are not satisfied with how a media reporter presents themselves or if you are not familiar with the media outlet they represent, you are completely entitled to not give an interview. You don’t have to give a reason – any ethical journalist will not challenge a simple “No, thank you”. Similarly, during an interview, you do not have to answer any questions you are uncomfortable with and you do not have to justify this refusal. You are also entitled to end an interview at any time and to withdraw your consent for the filming / recording being broadcast. Bear in mind that a professional, ethical journalist will not challenge this. The bottom line is: You do not have to justify your presence to anyone at the March for Choice, and if anyone pressures you to do so, disengage and inform one of our stewards. Some people worry about encountering aggressive counter-protesters at pro-choice marches. 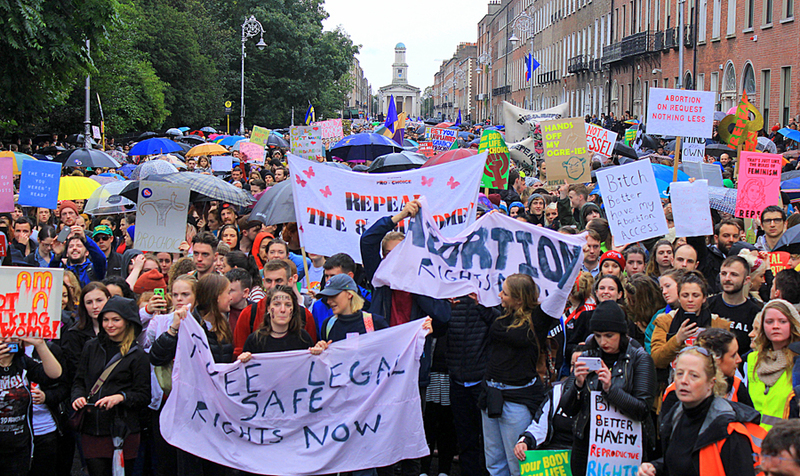 We want to assure you that we have never had a large or even medium-sized anti-choice presence at any of the five Marches for Choice that we have organised. Occasionally, individuals may take it on themselves to be loud or disruptive, but this has rarely had much impact and is far outweighed by the thousands of positive pro-choice marchers filling the streets. Our March for Choice is a family-friendly, positive, fun event. We welcome drums, samba / marching bands, musical instruments, singing, chanting – anything that makes a lot of noise! You may be needed to drown out some anti choice people but mostly we want the march to be loud, colourful and proud! Here’s a great example from last year’s March of using fun singing to drown out anti-choice negativity. As with any march or rally we are liaising with the Gardaí. We have trained legal observers, stewards and spokespeople. We don’t expect any incidents but we are well-briefed on security requirements, so that you can all relax and focus on having a great day! We know not everyone is comfortable with large crowds so perhaps you might be more comfortable near the end of the march where the crowd is more dispersed. If you feel nervous marching, it can be a good idea to march somewhere in the middle of the crowd, where you may feel less exposed. We are proud to be pro-choice. This is a day for community and pro-choice unity. There is room for all emotions at the march, happiness, joy, anger, sadness, resolution. This is our day! It’s Time to Act and we want to make sure you feel comfortable and safe enough to join us so we can demand change together.